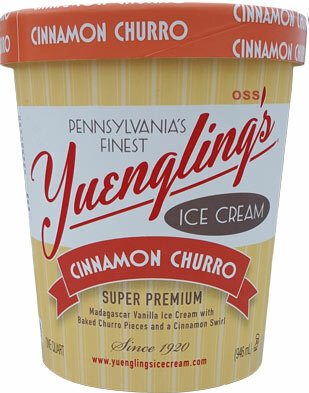 [New for 2016] You might remember that Yuengling was basically the first ice cream companies to mention a 2016 lineup Since then a whole lot of new ice cream has come out, and technically I only found one of their 2016 flavors, but it's the one I wanted to try first anyway. Ooooo, so pretty with the swirl popping out in the middle and the little bits everywhere. There was a strong smell that hit me as I opened it as well. Ahhh, I can't wait, I must scrape the lid and sample this.... whoa, that's no cinnamon flavor, that's a fireball flavor! Ha, those weren't churro bits, those were the tips of churro chunks! I'd say that I'm surprised that Yuengling went with the bold fireball blend of cinnamon and spices, but I'm really not. They just kind of roll their own way. In fact, I'm kind of reminded of their spiced pumpkin roll ice cream right now. The churro chunks have a bit of texture to them, but not too hard and not too soft. They are pretty big so you definitely notice them, but the cinnamon blend is really dominating everything so it's hard to say exactly how they taste. Despite the pop there is a sweetness to this flavor as well that keeps driving me forward. Well, that and the fact that if I stop eating, that's when I notice a bit of cinnamon burn. I know many of you won't even notice, but for me, it does mess with my ability to enjoy it. Ahhh, I shouldn't say it that way. It's a neat flavor, I just prefer cinnamon flavor to cinnamon burn. My cup is almost empty and I just got two nice churro chunks on that bite. They definitely help round out this flavor and I have no problem recommending this one if you dig this style of cinnamon flavoring. 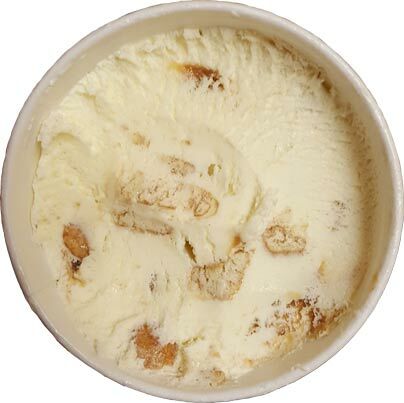 On Second Scoop: I probably shouldn't have started this scooping by digging in to the bold swirl. That's right, I'm standing by my fireball claims of yesterday. 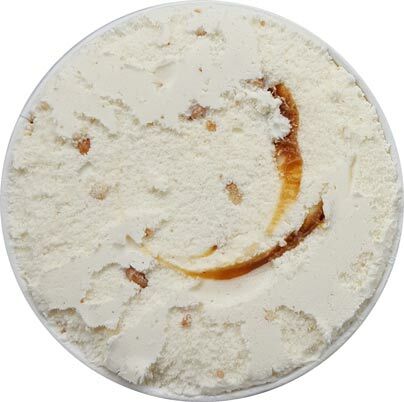 So if you dig fireballs and ice cream, you should probably try this. As for me, well, I started wondering how this might taste with an apple flavored ice cream. Would the apple take off the edge or would the cinnamon continue to just dominate everything. This is definitely an interesting flavor, it's just not my thing. But it IS cinnamon, and not reminiscent of "fireball candy" or peppers, right? I can handle cinnamon, and a lot, but not spicy or fireball candy. This flavor looks amazing. Like you Dubba I love cinnamon flavors and it seems they always discontinue the ones that do come out. I remember when TH had a churro and apple cinnamon flavor that made my life! I'm going to check out my shelves for this brand, although I'm not sure NJ ShopRite's carry it!